Home > Uncategorized	> Elm? This is an interesting picture. It is a small red flower on a tree branch. 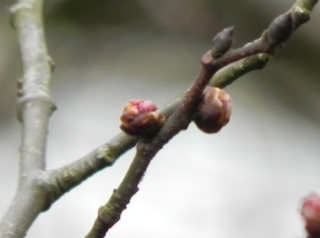 It could be the male flower of an elm tree. Elm trees suffer from Dutch Elm disease and Dutch Elm Disease is a fungus that is associated with the Elm Bark Beetle. Wikipedia notes that the disease is actually from Asia where presumably the elms are resistant to it but it was first identified by a Dutchwoman – so they got the blame. The beetle flies at certain height and so (usually young) trees under that height remain unaffected until they reach a certain maturity. If this is an elm tree it is actually growing in the miniature gorge that our river has carved for itself – so it may be that the beetles are flying straight over and missing it – or maybe the tree just ducks when it sees them coming.